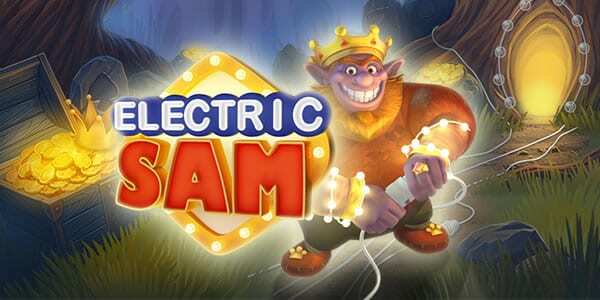 Meet Electric Sam, the impish King of the forest and lover of high-voltage slots. This is a game you can play at Wizard. It is a game with intense strategy mixed with traditional fruit machine symbols; neon cherries, and juicy watermelons with a twist. 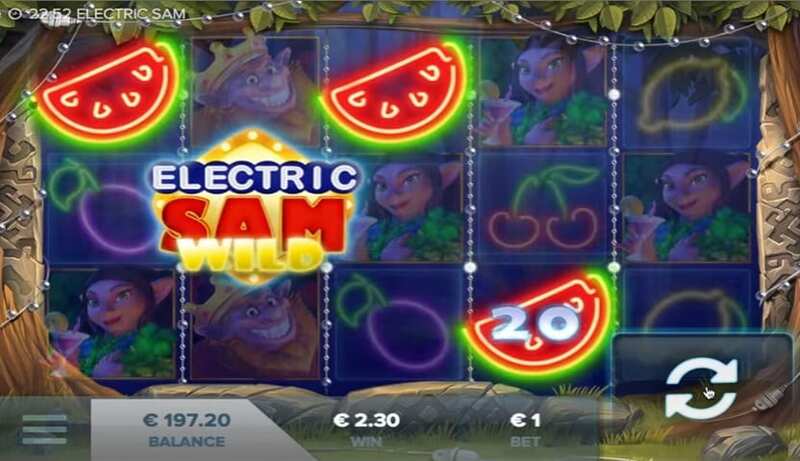 Charge yourself up and join Sam and his friends for this high-octane adventure of free spins and kooky grins. Electric Sam is a big fan of electricity and in particular light bulbs! So get yourself ready for some high voltage, high octane action with this fantastically quirky and cheerful slot. Let those neon lights shine! 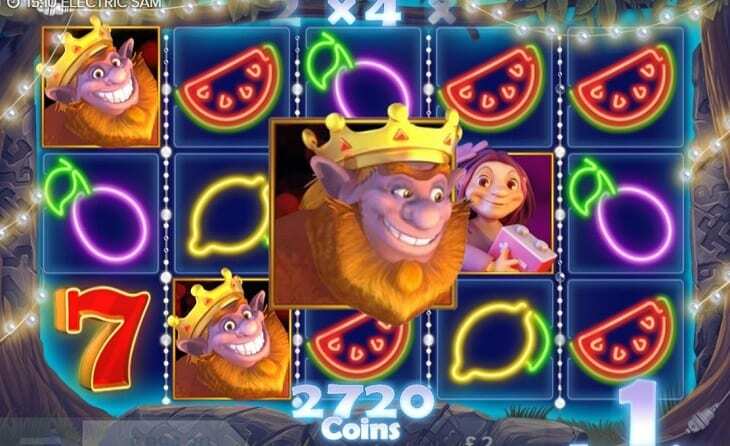 You can indulge yourself with spin slot games, and this one is brought to you by Elk Studios. This is probably Elk’s best and most played game on the market. Elk have kept it close to their chest why they felt the need to design a slot game based on a ginger crown wearing guy (sorry king, I do beg your pardon your majesty) who seems to live in a forest with a couple of portly elves named Sandra and Maggie, but whoever came up with the idea deserves a big pat on the back because this game somehow works! The game advertises that it has a whopping 243 ways to win. The wild symbol is the game logo, Sam himself acts as a sticky wild, Sandra will shower you with multipliers, and Maggie will treat you to some imploding symbols! The wild symbol will replace all others except the free spin symbol. Make sure to read bonuses and features below before you try the best slots. For the other symbols look out for neon lemons, plums, watermelons, and cherries. It’s just like having a big immersive fruit machine in the middle of Times Square! You can try the different strategies and see which one suits you! The soundtrack of this game is as wacky as the theme but don’t let it distract you from the sound of ringing bells. Landing 3 bells anywhere on the reels activate the free spins feature. You will receive a generous five, ten, or fifteen free spins. As mentioned earlier, this is not the only bit of bonus play. 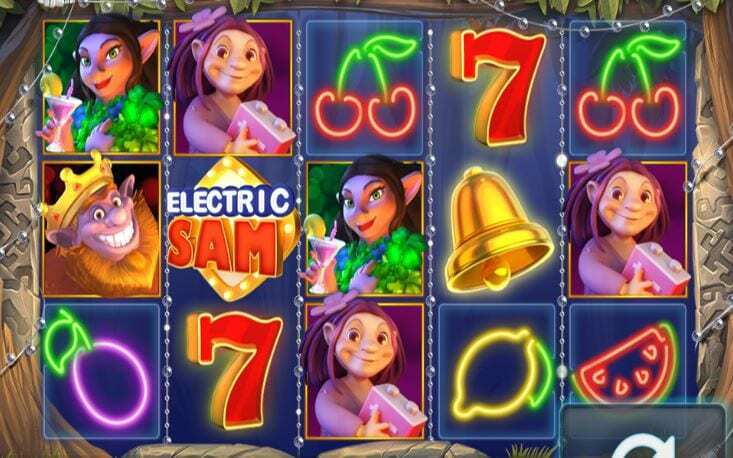 Land some Sams, Sandras, and Maggies and the game will start to grow its own arms, legs and feet and take you on a journey you don’t usually get to go on in your more traditional slot game. Without a doubt, the betting strategies feature is what sets this game apart. Elk really has delivered the goods with this one. If you’re new to playing slots then this is a great feature to have a play around with and see which one works for you. Apart from that, it’s a kooky game that will brighten up your day with its wonderful colours and characters. It’s really simple and easy to play and you’ll no doubt have hours of fun playing it. Now, how about trying our aloha slot?